Another Kim Kardashian–Paris Hilton reunion? That’s hot. The friends-turned-frenemies-turned-friends again partied together on Saturday night at Paris’ belated birthday party, which doubled as a St. Patrick’s Day bash. Kim’s sister Kourtney Kardashian also joined in on the festivities. Kim shared on her Instagram Stories videos from the event, including one that shows Paris wearing a plunging sparkling silver catsuit and posing at the bottom of a fancy staircase, in front of a display of Tiffany blue balloons. 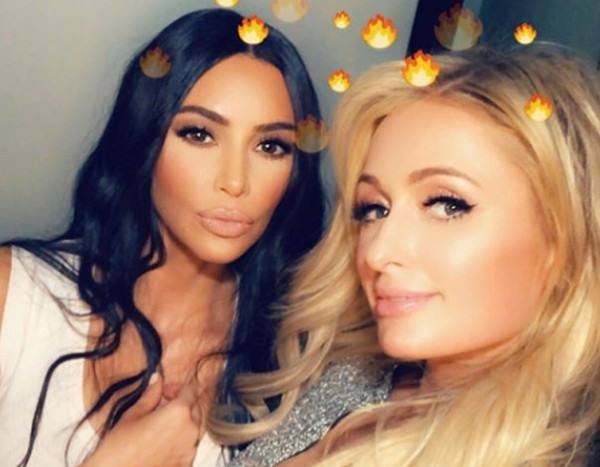 Kim also shared a selfie photo and video of her and Paris. The heiress, socialite and former reality star had actually turned 38 in February. The two have known each other since they were children and appeared to be close in the early 2000s, and .The Simple LifeKim famously helped Paris rearrange her closet on the latter’s reality show The two then feuded several years later, then eventually became friends again. In 2016, the two reunited at Kris Jenner‘s annual Christmas Eve party. Paris also attended the family’s most recent holiday bash, this time held at Kim and husband Kanye West‘s home. Also in 2018, Paris dressed up as a “Kim Clone” in ads for Kanye’s Yeezy Season 6 campaign.